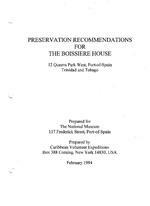 INTRODUCTION Preface This report has been prepared for the National Museum, Port-of-Spain, to determine the steps and work needed to restore the Boissiere property at 12 Queens Park West, Port-of Spain, Trinidad. We have worked with Claire Broadbridge, Director of the National Museum, in preparation of this material The family members living in the house including Alison and Luis Young, and Peter Boissiere were most helpful in showing us the building and the historic documents and photographs about the house Report Goals I. To develop guidelines for the physical restoration of this historic property 3 To suggest possible uses which can help sustain and maintain the building 3 To develop planning steps and priorities for restoration and re-use 4 To suggest areas for further investigation and research. Summary of Recommendations The house of the Bouissier family at 12 Queens Park West, in a prominent location on the southwest corner of the Savannah in Port of Spain is a wonderful example of turn of the century Victorian architecture. The building is remarkable for its wealth of intricate fretwork decoration, and unique roof line with gables, turrets and dormers. The house and its contents are still remarkably intact, a time capsule from the turn of the century Fortunately there has not been much modernization, or alterations over the years And although lack of maintenance may have preserved the building from inappropriate modifications it also has resulted in conditions which are deteriorated and need immediate attention. The restoration and preservation of this house and its contents are a great opportunity to preserve a unique and noteworthy example of residential architecture and life And because of the architecture and historical significance, this house is a prime site for a cultural and educational attraction open to the public.